AWS Step Functions makes it easy to coordinate the components of distributed applications and microservices using visual workflows. You can scale and modify your applications quickly by building applications from individual components, each of which performs a discrete function. You can use Step Functions to create state machines, which orchestrate multiple AWS Lambda functions to build multi-step serverless applications. In certain cases, a Lambda function returns an error. Regardless of whether the error is a function exception created by the developer (e.g., file not found), or unpredicted (e.g., out of memory), Step Functions allows you to respond with conditional logic based on the type of error message in the form of function error handling. The function error handling feature of Task states allows you to raise an exception directly from a Lambda function and handle it (using Retry or Catch) directly within a Step Functions state machine. 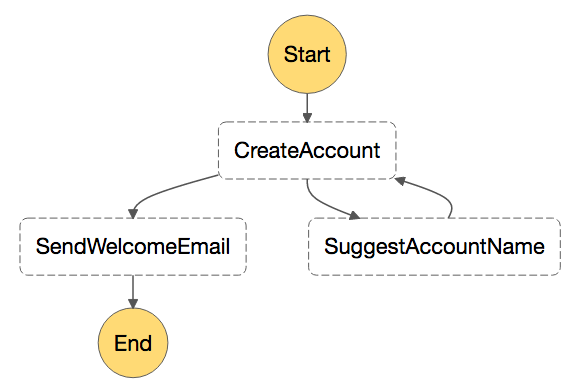 CreateAccount is a Task state, which writes a customer’s account details to a database using a Lambda function. If the task succeeds, an account is created, and the state machine progresses from the CreateAccount Task state to the SendWelcomeEmail Task state to send an email to welcome the customer. However, if a customer tries to register an account with a username already in use, the state machine suggests a different name to the user and retries the account creation process. The Lambda function raises an error, triggering the Catch clause. This causes the state machine to transition to the SuggestAccount task state, suggesting a new name before transitioning back to the CreateAccountState. You can implement this scenario using any of the programming languages that Step Functions and Lambda support, which currently include Node.js, Java, C#, and Python. The following sections show how to implement a Catch clause in each language. At runtime, Step Functions catches the error, transitioning to the SuggestAccountName state as specified in the Next transition. Note: The name property of the Error object must match the ErrorEquals value. The function error handling feature of Step Functions makes it easier to create serverless applications. In addition to the Catch clause shown in this post, you can apply the same pattern to Retry of failed Lambda functions. While you can create Catch and Retry patterns using a Choice state, using Catch and Retry in your Task states allows you to separate exceptions from branching logic associated with the common happy paths through your state machines. Function error handling integrates with all supported Lambda programming models, so you are free to design your application in the programming languages of your choice, mixing and matching as you go. To create your own serverless applications using Step Functions, see the AWS Step Functions product page.